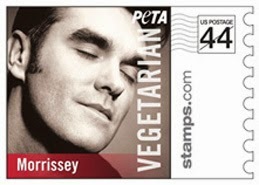 Morrissey is one of the stars included on PETA's 2013 edition of Vegetarian Celebrity U.S. PhotoStamps. Belinda Carlisle, Joan Jett, Russell Simmons, Bob Barker, and Pamela Anderson are some of the other celebrities included in the series. Check out the full series here, and order here.